Ok so this is just a quick note to say I am excited about a story mapping session coming this week. Normally I don’t broadcast thoughts like this but (a) I wanted to let you know I’m still alive and (b) this is significant in my organization. My users are executive level and we have never tried to map out an agile project with any of them before. We will have real high-level stories, a real map, real cards, developers in the room, and several actual users there too! So that really couldn’t have gone better. 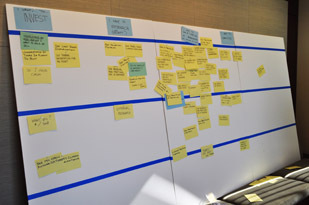 We started with a review of our project goals, which they helped us improve, then I gave a quick overview of what a storymap was (and what stories are) and encouraged one of our sponsors to stand up and put the card where he felt it should go, priority-wise. After some clarifying questions, he pinned it up and we were off. We tried to help things along by having pre-written cards for the high level categories and also for the epics they were prioritizing and started by giving them permission to tear-up, re-write, and add to these and they did all of that. Categories were completely re-worked to better fit their mental models for the way they worked and the time flew. jumbled pile of cards on the board — perfect. We have since organized it a bit more and are working through some initial paper prototypes to share back with our sponsors and some other users. 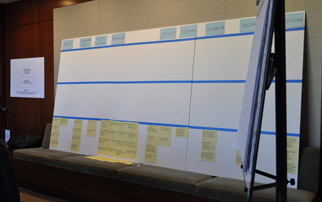 Nice picture of your story mapping board. I like the idea of having pre-written cards for backbone categories. Also, your reminder to review project goals is a good one. I recently sat through a story mapping session (in my role as developer) led by someone who was new to the story-mapping concept and ill-prepared. It didn’t go well. Obviously you were well-prepared. It’s great to get off to a good start with your users. Well-run story mapping gives users/stakeholders a degree of confidence that the team is focused on understanding what needs to be built (…and built in an order that considers both a “systems” view and goals/priorities). Very nice. I recently learned about story mapping in a Product Owner course https://www.zilverline.com/training/certified-scrum-product-owner where started off with a brainstorm, and then created something called a ‘walking skeleton’. I see you have a link to Jeff Patton’s site. He also has a great book out now.